MasterFormat is the industry’s leading resource for organizing project manuals and specifications, construction project filing systems, construction product information, and cost estimates. The new, updated, improved edition is coming later this spring, and this article offers a sneak peak on what has changed from the previous edition. Nova Scotia’s south shore is notable for its deeply forested landscape and rolling hills overlooking the many bays along the Atlantic Ocean coastline. Therefore, it was a natural choice for a new lifestyle centre in Lunenburg County, where the locals have a long-standing connection to the timber industry. Diamond Schmitt Architects designed an open-concept collaborative workspace for the National Research Council Canada (NRC) in London, Ont. A new facility designed for automotive and manufacturing innovation has opened at the National Research Council Canada (NRC) office in London, Ont. 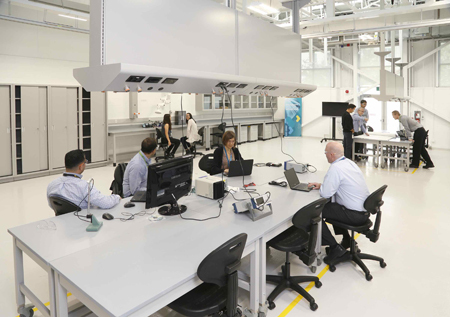 The open-concept collaborative workspace designed by Diamond Schmitt Architects transforms an existing NRC laboratory to accommodate all levels of the automotive and manufacturing supply chain to work together with the NRC in developing technical solutions for the design of products and services. “These advanced high-tech sectors will operate in a range of workspaces designed for collaborative ventures that also provide project confidentiality,” said John Featherstone, principal, Diamond Schmitt Architects. Program space at the 15,550-m2 (16,740-sf) Manufacturing and Automotive Innovation Hub includes four labs, two vehicle bays, a high crane bay, and 857 m2 (9225 sf) of collaborative workspace on the second floor. Large, energy-efficient skylights are used in the diagnostic labs to increase daylight. A moving partition separating the automotive bays doubles as a whiteboard. “We are very excited to open the NRC London Manufacturing and Automotive Innovation Hub, our newly renovated collaborative facility to better support Canadian industry with the rapid advancements in manufacturing and vehicle technology,” said David Muir, director of research and development at NRC in London. Diamond Schmitt is currently working with the NRC on two additional projects. The Canadian Centre for Advanced Material Manufacturing (CCAMM) in Mississauga, Ont., and the new Advanced Manufacturing research facility in Winnipeg.